We encountered G. Evelyn Hutchinson in two posts last year (see “Diatoms from the roof of the world” and “The Clear Mirror”). In the second of these, I made a passing comment to the “paradox of the plankton” which he both proposed and partially resolved. He asked “how it is possible for a number of species to coexist in a relatively isotropic or unstructured environment all competing for the same sorts of materials” when, “according to the principle of competitive exclusion … we should expect that one species alone would outcompete all the others …” The answer, he suggested, was that the world that plankton inhabit is far less uniform than may first appear to be the case, providing opportunities for a range of organisms, each with their own ecological specialism, to thrive. Exactly the same question could also be asked of the benthic algae which seem to show an extraordinary diversity. It is not uncommon for me to find fifty or more algal species in a sample from one habitat on one day within a river. They are all bathed in water with the same chemical composition, so why is it that one competitive species does not overgrow all the others to produce a monoculture? Whilst I was pondering this question, I recalled a paper written by Dicky Clymo, who supervised my undergraduate dissertation. He was a specialist on Sphagnum and peat bogs and, in 1973, wrote a paper showing how variations in the values of two physical factors (water table depth and light) and two chemical factors (hydrogen and calcium ions) across a peat bog could create a mosaic of habitats that allowed twelve different species of Sphagnum to thrive. If we assume that a typical diatom sample covers at least 10 cm2 of the surface of a submerged rock, then this would be equivalent to surveying at least a square kilometre of peat bog, providing plenty of opportunity for this level of habitat variation. Sampling microscopic algae is limited by our own senses: a rock surface that may look smooth to our eyes may actually have a microtopography that creates a range of habitats within which different species can survive. 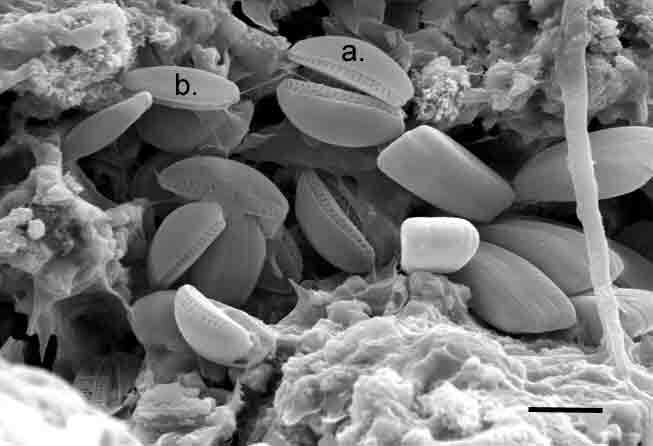 The image below shows small cells of the diatoms Amphora pediculus and Achnanthidium minutissimum nestling in crevices on a rock surface that, presumably, offers some protection to them from marauding grazers. Why am I making this point? I frequently encounter comments such as the following in papers about diatoms: “poor species discrimination can lead to the combination of morphologically similar, but ecologically disparate taxa” and the suggestion that this can “compromise ecological status assessment”. There may be situations where this is the case, but also situations where these taxa can happily co-exist in within a very small area because the ecological factors that separate them operate at a much more localised scale than the pressures we are trying to assess. Diatomists, I am afraid, are often naïve ecologists who rarely go beyond correlating species distribution patterns with a few chemical and environmental variables that are relatively easy to measure. There is still a lot that we don’t know about how the diverse assemblages of diatoms that we encounter in rivers and streams interact with the other organisms around them, let alone with aspects of their physical environment that are invisible to the naked eye. A scanning electron micrograph showing the surface of a rock showing Amphora pediculus (a) and Achnanthidium minutissimum (b) living in crevices. Scale bar: five micrometres (1/200th of a millimetre). Photograph: Marian Yallop. Clymo, R.S. (1973). Growth of Sphagnum: some effects of environment. Journal of Ecology 61: 849-869. Hutchinson, G.E. (1961). The paradox of the plankton. American Naturalist 95: 137-145. This entry was posted in Uncategorized and tagged diatoms, Dicky Clymo, ecology, G.E. Hutchinson, paradox of the plankton, Sphagnum. Bookmark the permalink.